It’s a gray, moist Monday here in our spot of North Carolina, but I was pleased to find Camellia japonica ‘Debutante’ full of buds, many of which are open and lovely. They have returned most happily after the freezing weather earlier in the month just in time to participate In a Vase on Monday. The camellias are supported by a few sprigs of Autumn fern and two from our collection of haskioki. Hashioki, in Japanese dining, serve as a place on which to rest ones chopsticks. Please visit Cathy at Rambling in the Garden. Cathy hosts this weekly display of items from our gardens. See what she and others are sharing this week. 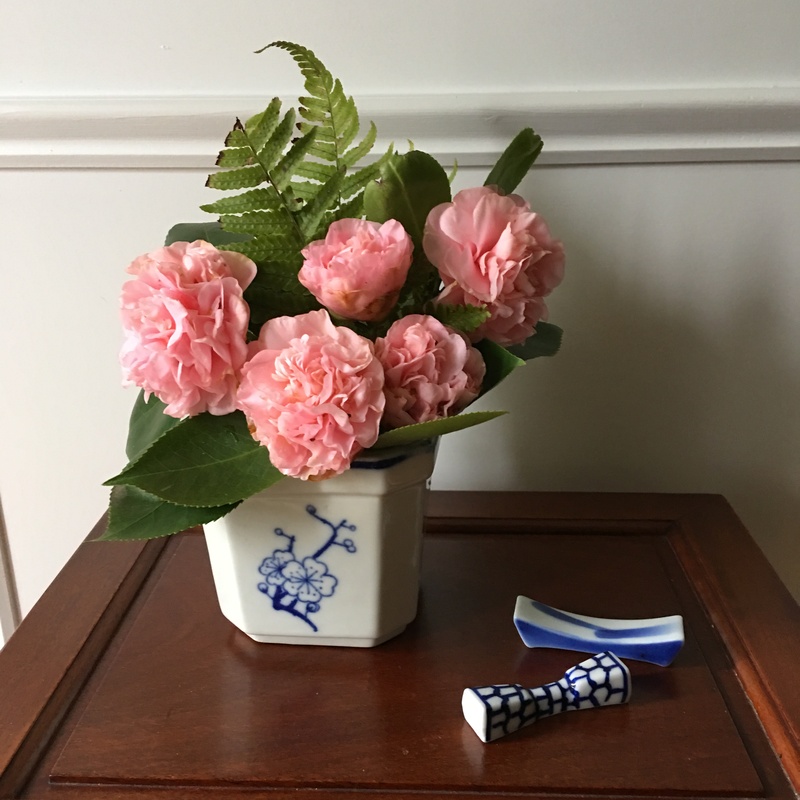 This entry was posted in Gardening, In a Vase on Monday and tagged Autumn fern, Camellia japonica 'Debutante', hashioki, Rambling in the Garden. Bookmark the permalink. An old favorite, Debutante!Thanks for sharing them. Debutante is indeed a beauty. this one has a history: it wasn’t doing well where I first planted it. I moved it to the edge of the woods, hoping it would revive, and lo and behold it is thriving there with almost no help from me. The dreaded right plant in the right place strikes again! I love the camellias. I may have commented on this before. I grew them in England but now in Ontario Canada the climate is not right for them. Thanks for posting this lovely group in a vase. I’m sorry you can’t grow them there. I love camelias! My plant is cross bred, so it has red and pink. They are still in small buds. Probably because the plant is in a spot that doesn’t get too much sun in the winter. They bloom in late winter. Come to think of it, as soon as the rain storm is over, I’ll trim the hibiscus which is overshadowing the camellias! Thank you for sharing. Thanks. Camellias are special winter flowers here and much appreciated. I can see that they are beautiful in your vase. Such perfect blooms, they almost look unreal. Thank you, Christina. I assure you that they are real…and a joy. Thank you again, Cathy. We are so fortunate to be able to have camellias at this time of year. It’s nice to have a camellia back again. And thanks to you once again for this grand idea. Lovely. I haven’t often seen them used as cut flowers. How long will they last, do you know? We’ve had them last up to a week…in the best conditions.